A Random Guide to Logic and Life is a book of essays about logic, common sense, humor, financial advice, patriotism. spiritual wisdom, and more. It's a book of one-page essays accompanied by a graphic illustration on the page opposing the text. In this era of "sound bites," my hope is that my punch lines will linger with the reader beyond the essays whose message is often forgotten because it got lost in excess verbiage. "Another terrific read from James V. Lee! 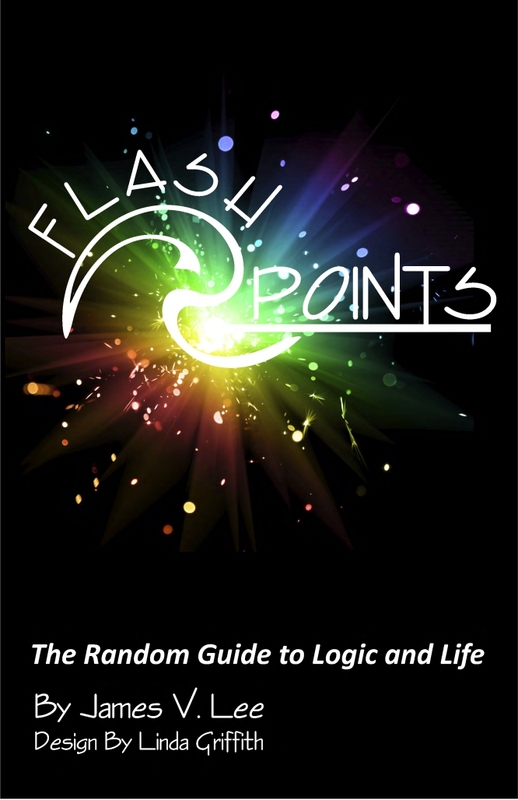 Flash Points gives voice to his clever writing style and insightful observations. One more interesting look into Lee's vast background. President/CEO Ziglar, Inc., proud son of Zig Ziglar"
James Lee has taken pondering life's little puzzles to the next level. His short essays and anecdotes are perfect for pulling us back to reality and teaching us not to sweat the small stuff and his historical perspective allows us to realize that, in the end, there's very little we can control so it's best to just enjoy the ride. Can anything good come randomly? It can if it's in a book named Flash Points written by James V. Lee. Why would his random words be special? Probably because few people have had the experience of rising from shore-based teaching and traveling all over the world teaching sailors aboard all kinds of U.S. Navy warships in the Navy's Program for Afloat College Education (PACE). What would you like? Logic, common sense, humor, financial advice, patriotism, spiritual wisdom, and above all, brevity? Well, it's all there inside the covers of one book. Readers of all ages have a great example in James of how to share your wisdom and experience in a way that is helpful, fun and, perhaps most of all, memorable.